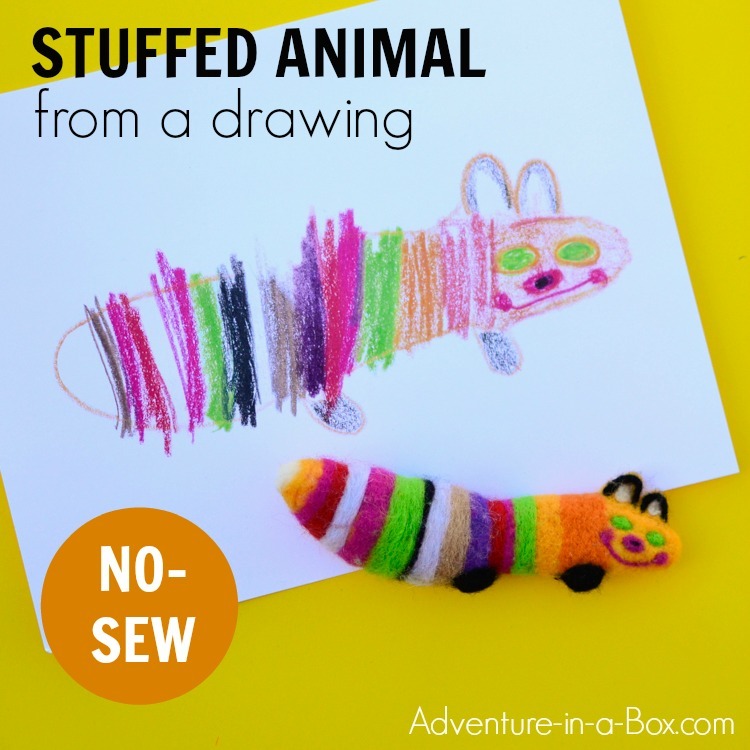 Make a stuffed animal from a drawing… without sewing! 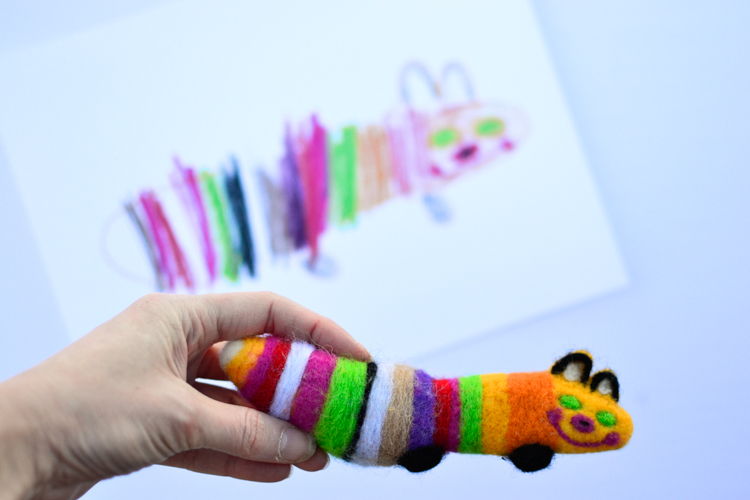 The simple needle felting project will allow you to create a special keepsake for your child. 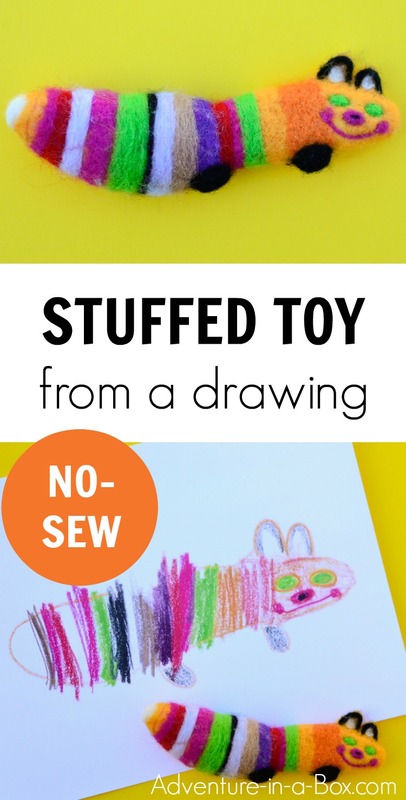 You know those companies that turn children’s drawings into stuffed animals? I always find the results absolutely adorable! 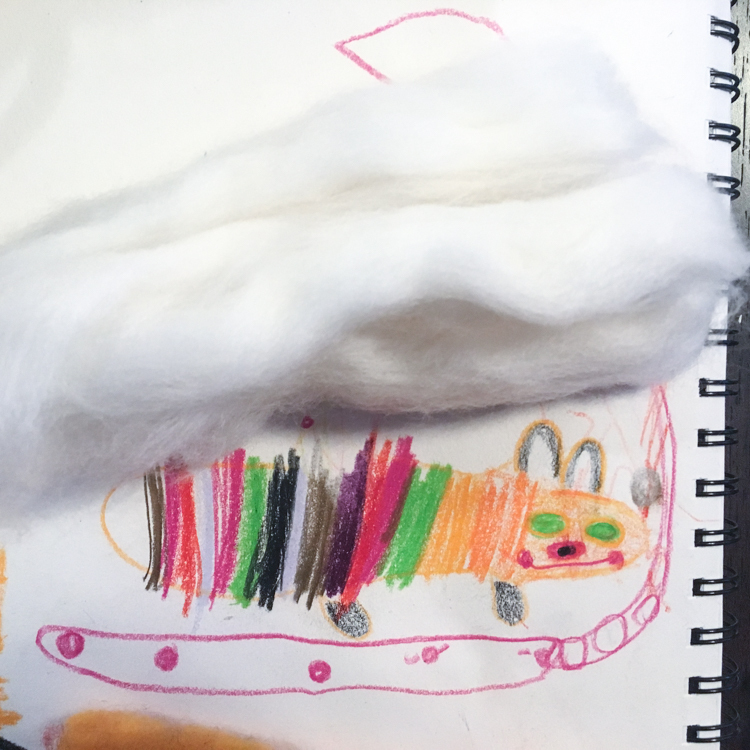 It is fun to look at them closely, noticing how different sketch marks have been represented with fabric or embroidery. 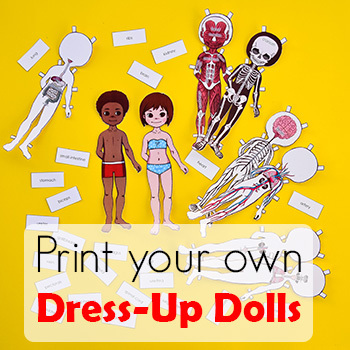 The problem is, as much as I love crafting, I am not all that confident with sewing. 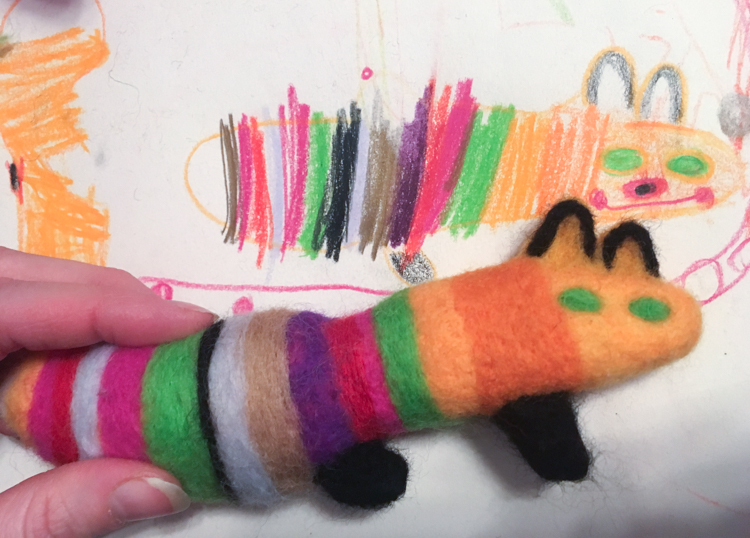 So, that was the end of my ambition to make a stuffed toy based on a drawing… until last year I discovered needle felting. Well, I’d known about needle felting for a long time before that. But the fact that it so explicitly stated the need for needles made me suspect that it will be similar to sewing. My impression was all wrong. 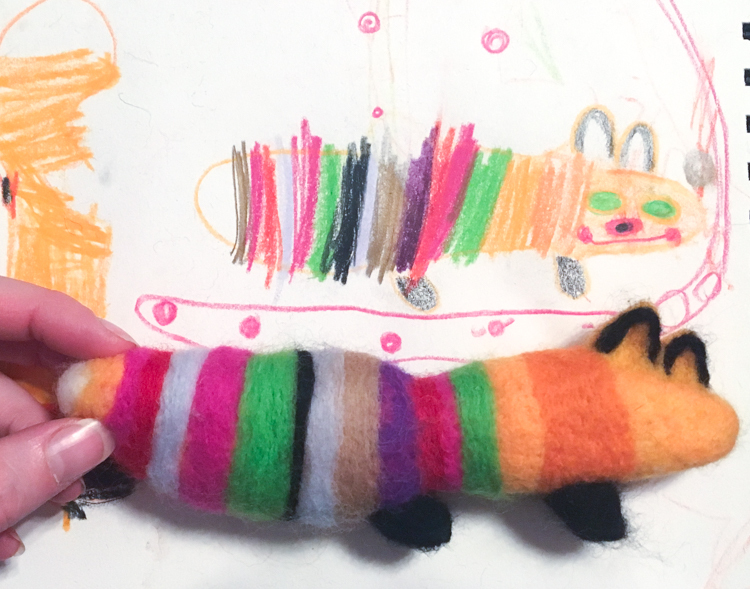 Here you can find out more about how I started needle felting, also sharing my advice on how others can try it in a simple and budget-friendly way. Then, some time last December, as much talk in our family revolved around presents, my son learned that I like foxes. Not willing to wait the days that were still left until Christmas, he sat down and drew me a fox right there. Not just one. He drew me half a dozen foxes. There were foxes standing and foxes leaping, red foxes and pink foxes. And then there was one fox that looked less realistic than the rest of them, but – oh, I loved it! 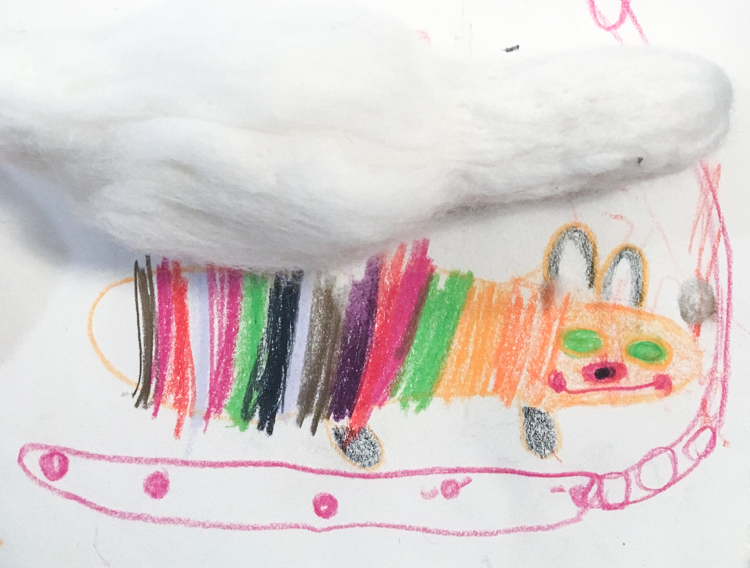 It had crazy colours, and a long tail, and an enormous smile, but most of all, it had so much character that I just couldn’t help but adore that fox. 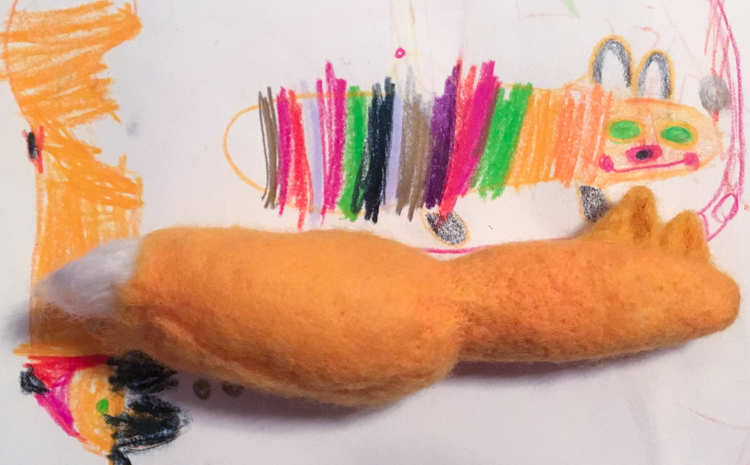 I wanted to show my son how much I appreciated the present, and the idea of turning the drawing into a stuffed animal immediately occurred to me. 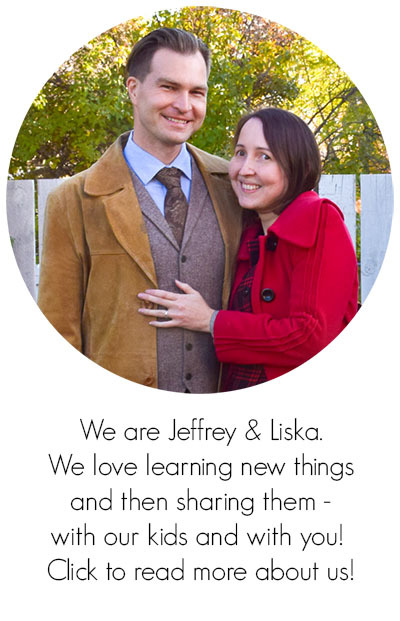 But… I still didn’t do all that well with sewing. Maybe if I used felt? Or if I needle felted it? That was it! I decided to needle felt it. I put my plan into action on Christmas eve. We were visiting with a family, and it was a pleasant way to keep my hands busy while chatting. Then, on Christmas morning, the little foxy was underneath the tree, among with other presents. 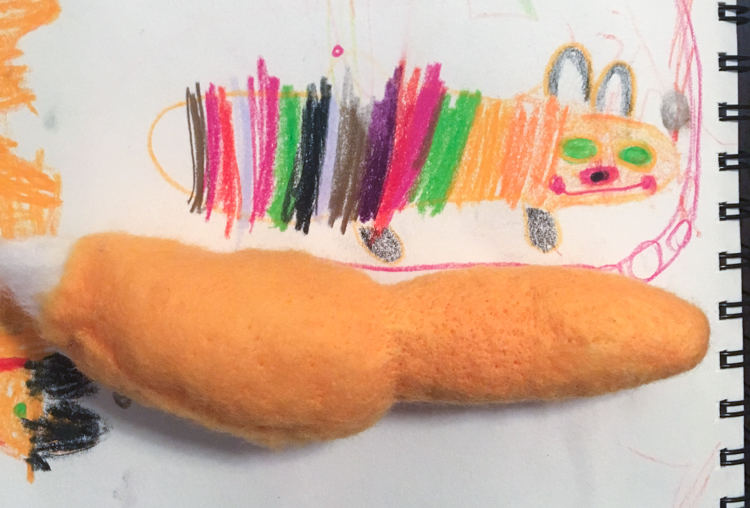 Actually, my son suggested that he would like to give the toy to his sister, so that was who got the result of our collaborative work. 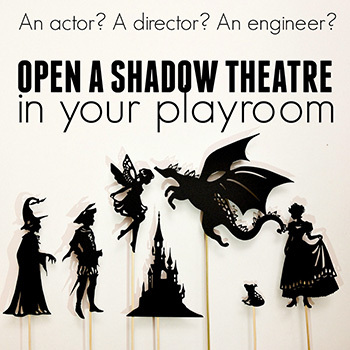 Both for him and for me, it was an unforgettable experience! 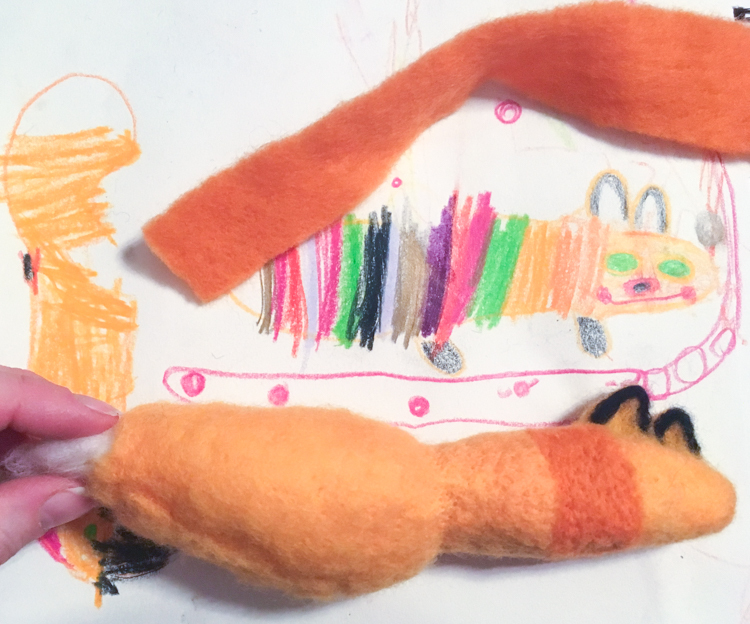 If you want to read in detail about all the different tools for beginning needle felting, check this post! 1 — First, I got a good chunk of white wool to use as a base. 2 — For giving the fox its base “orange” colour, I used a scrap of prefelt. Prefelt is felt that still has enough loose fibres to attach to loose wool or other prefelt. While not absolutely necessary for needle felting, it comes in useful sometimes and speeds up some work. Using loose wool would have worked just fine though! Again, on the picture below the body part is lightly needle felted, while the tail part is not yet. 3 — For ears, I modelled a couple of triangles. I used loose wool, so you can see that the colour is slightly different. Then I needle felted them onto the body. 4 — I rolled some black wool between my palms to create two thin black sausages, that I needle felted onto the ears. And for others, I used loose wool, wrapping it around the body of the fox, then needle felting it onto the body. 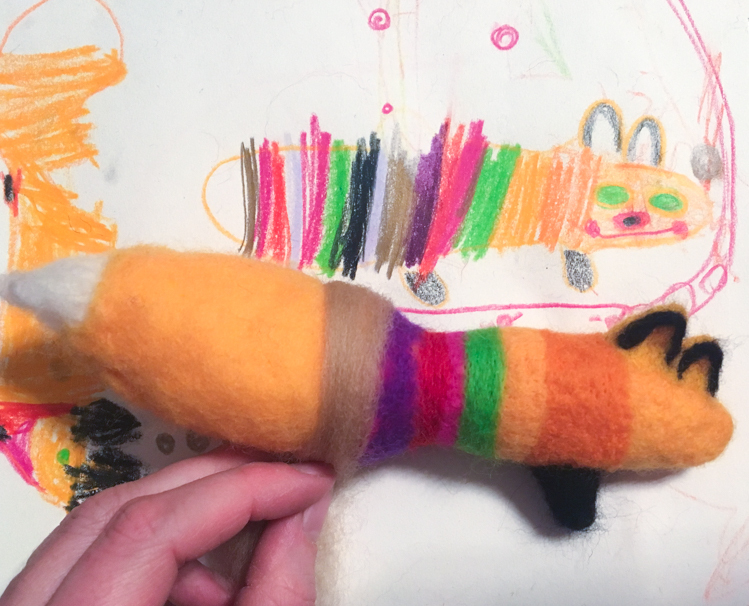 6 — I finished the stripes and added the legs – two sausages of black wool, needle felted onto the body of the fox. I considered making four of them, but two seemed to add to the character of the stuffed toy! 7 — The last step is adding the facial features. I always like to leave the face as the last step because the toy comes alive as I add eyes and mouth. I used thin threads of wool for making the smile. And the fox is ready! I also scanned the drawing, so that I could keep them both. 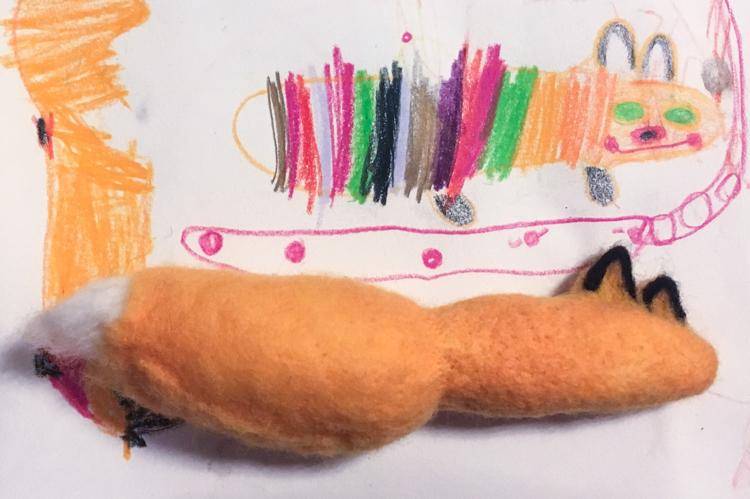 It was, in many regards, a very special project: the drawing was a present to me from my son, and then I made the stuffed toy to show him my appreciation for his art, and he enjoyed the experience, but then he ended up deciding that his sister should have the toy. 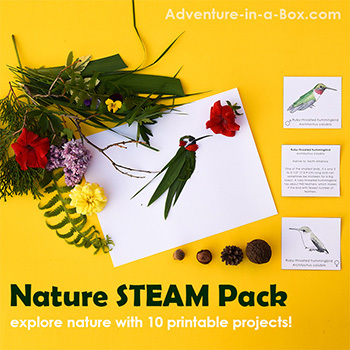 Everyone got something from this! 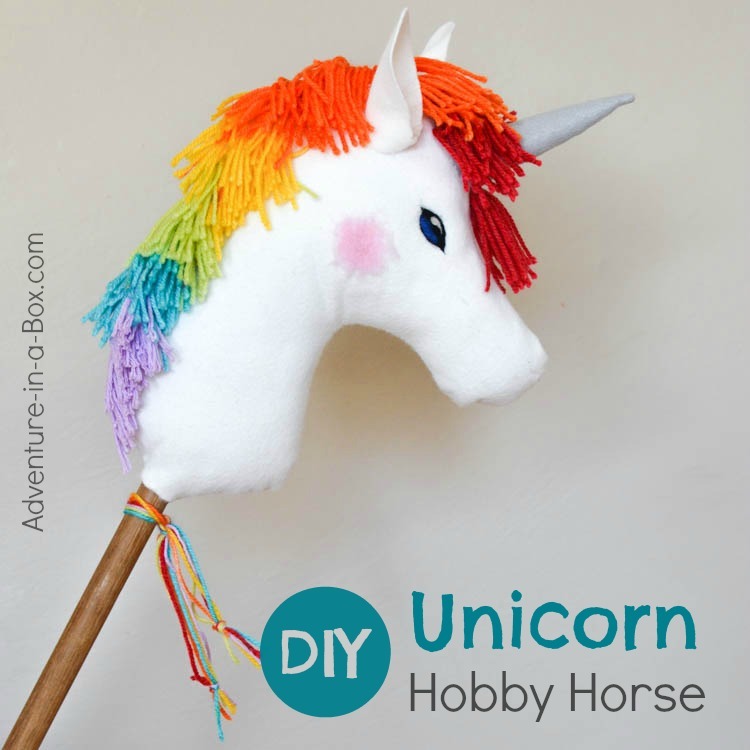 Make a unicorn hobby horse! 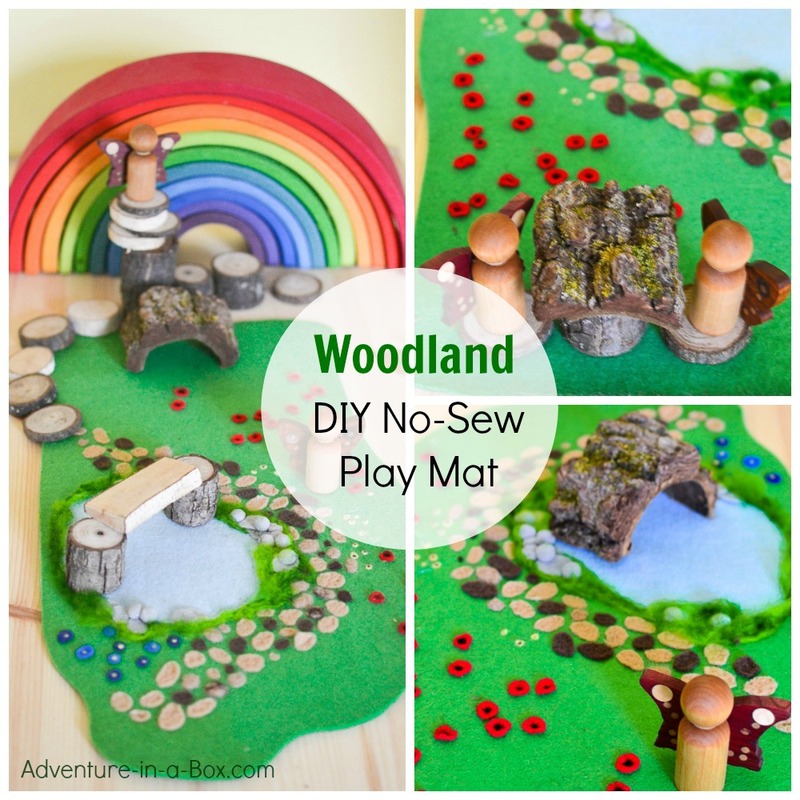 Make a woodland play mat!